The Canadian Mental Health Association, Ontario is pleased to offer advice to the Mental Health Commission of Canada on what we recommend be key accomplishments in its first three years, and identify how we how we can assist the Commission in achieving these objectives. Our division is part of a nation-wide, charitable organization with a respected history of promoting mental health and supporting recovery for persons with a mental illness. As a provincial organization, we do this through knowledge transfer, policy analysis, advocacy for health public policy and supporting our 32 branches who deliver community mental health services in Ontario. The development of a national mental health strategy is an essential outcome, as it is the umbrella under which all other directions for action will be situated. There has never been a better opportunity — the Commission must serve as the catalyst to ensure that a national mental health strategy is in place by its third year — it will be your legacy to Canadians. A framework is required to guide a national mental health strategy and we encourage the Commission to incorporate “A Framework for Support.”1 While the original intent of the framework was to specify how a person-centred system should be fashioned to support recovery of persons with serious mental illness, the framework in fact identifies how to promote mental health, as well. The framework identifies the personal resources which are needed for individuals dealing with their mental illness in order to develop resilience, feel hopeful and experience well-being. Having a practical understanding of one’s illness, a sense of purpose and inclusion within society are key components of the personal resource base. Next, peer support, the involvement of families, as well as generic and specialized services are all essential resources from the community for recovery. Thirdly, the knowledge resource base emphasizes that experiential knowledge as well as scientific evidence should be included when acquiring information to support recovery. Strategies which support these dimensions must be included in a national mental health strategy. Mental health services are but one component of the aforementioned framework. While there is general agreement in the literature on what should be included in the basket of services available for persons with a mental illness, unless new and sustainable funding is provided through transfer payments to the provinces and territories, we believe it is not feasible for the Commission to spend their time defining targets for the delivery of mental health services. What we do recommend the Commission undertake with respect to mental health services is a knowledge transfer initiative to compile and synthesize promising practices already taking place across the country that support this basket of services, and based on preliminary information, decide which approaches merit further inquiry. By your third year, these promising practices should be affirmed and the Commission should issue a call for proposals to fund through transitional monies cross-country program implementation and evaluation, similar to the process utilized with the Primary Health Care Transition fund. The lessons learned should then be shared using the proven strategies of knowledge transfer. We also encourage the Commission to pilot programs which promote the mental health of children and youth by funding the development of comprehensive, holistic, school-based programs. Schools are a natural environment to create supportive environments, reduce stigma and promote mental health for this population. There is evidence on effective strategies from which a national initiative can be built. Given that CMHAs are located across Canada, we can assist with identifying promising practices in the service system, in communities and schools and assist you to connect you with consumer and family groups. In addition, there is already archived research, including the grey literature, residing in many areas of the country that has not been widely shared. Moreso, there are a number of existing knowledge transfer networks in existence focusing on specific services and issues. We encourage the Commission to create a network of networks that connects all these networks, as interactive engagement is a key principle for knowledge transfer. Ontario Division has made knowledge transfer a key area of activity in our provincial work and we are interested to discuss how we might expand our capacity to provide leadership in the practical strategies of knowledge dissemination, which would include but should not limited to a website. With respect to work, we recommend the Commission focus on reducing stigma and discrimination in the workplace. Research demonstrates that general public awareness campaigns do not significantly change attitudes and affect behaviour. Rather, targeted strategies directed to specific audiences can be effective. There has already been much dialogue on how to deal with mental illness in the workplace. The Commission should convene stakeholders to identify feasible national goals and the Commission should support in its first three years anti-stigma and discrimination strategies that address mental illness in the workplace. 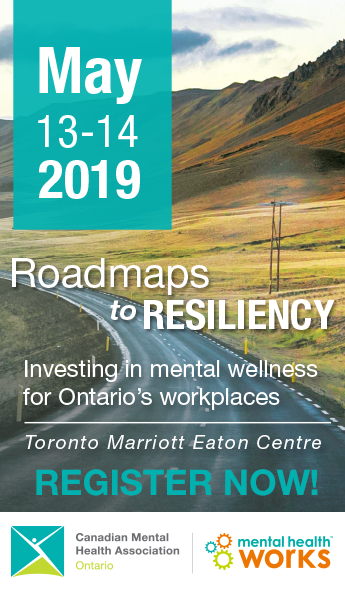 Mental Health Works is a program of CMHA, Ontario that is providing innovative anti-stigma workshops for employers and employees; and provides non-adversarial approaches to accommodation in the workplace. We are interested to discuss a national strategy that can build on the work we are already doing. We have one additional recommendation for the Commission on priorities for reducing stigma. We urge you to re-focus any consideration of a general public campaign to the specific goal of enhancing mental health literacy among Canadians. Misinformation, as well as self and societal stigma have historically limited individuals comfort and ability to prevent or act earlier to respond to mental health problems. Recent findings and recommendations from the Canadian Alliance on Mental Illness and Mental Health identify how Canada should be proceeding on enhancing mental health literacy. Here again, we encourage the Commission to support and build on this and other initiatives that are demonstrating leadership in this field.